100% Pure Silk. SILK SPOOL BLACK SIZE C (0.27MM) 310 YD. Plied from 100% pure silk, twisted thr..
100% Pure Silk. SILK SPOOL BLACK SIZE E (0.33MM) 200 YD. Plied from 100% pure silk, twisted three-pl..
100% Pure Silk SILK SPOOL BLACK SIZE F (0.35MM) 140 YD. Plied from 100% pure silk, twisted thre..
100% Pure Silk. SILK SPOOL BLACK SIZE FF (0.38MM) 115 YD. Plied from 100% pure silk, twisted th..
100% Pure Silk. SILK SPOOL BLACK SIZE FFF (0.42MM) 92 YD. Plied from 100% pure silk, twisted th..
100% Pure Silk. SILK SPOOL BROWN SIZE E (0.33MM) 200 YD. Plied from 100% pure silk, twisted thr..
100% Pure Silk. 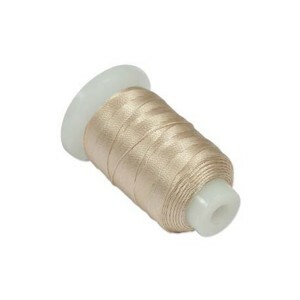 SILK SPOOL BROWN SIZE FFF (0.42MM) 92 YD. Plied from 100% pure silk, twisted th..
100% Pure Silk. SILK SPOOL GREEN SIZE F (0.35MM) 140 YD. Plied from 100% pure silk, twisted thr..
100% Pure Silk. SILK SPOOL GREEN SIZE FFF (0.42MM) 92 YD. Plied from 100% pure silk, twisted th..
100% Pure Silk. SILK SPOOL GREY SIZE E (0.33MM) 200 YD. Plied from 100% pure silk, twisted thre..
100% Pure Silk. SILK SPOOL GREY SIZE F 140 YD. Plied from 100% pure silk, twisted three-ply sil..
100% Pure Silk. SILK SPOOL GREY SIZE FF (0.38MM) 115 YD. Plied from 100% pure silk, twisted thr..
100% Pure Silk. SILK SPOOL GREY SIZE FFF (0.42MM) 92 YD. Plied from 100% pure silk, twisted thr..
100% Pure Silk. SILK SPOOL NAVY BLUE SIZE E (0.33MM) 200 YD. Plied from 100% pure silk, twisted thre..
100% Pure Silk. SILK SPOOL PINK SIZE E (0.33MM) 200 YD. Plied from 100% pure silk, twisted thre..